While it is clear that both the DA and the ANC need the EFF in Tshwane, the party is playing hard to get. For a party with a relatively small percentage of the vote, the EFF must be pleased by the amount of effort their rivals are putting into wooing them. The Mail & Guardian reported on Friday that according to ANC elections head Fikile Mbalula, the party is attempting to meet with the EFF next week. “We will meet with them quite clearly. There have been meetings [between ourselves and the EFF before] in terms of the local structures. We will meet with them, permitting, next week, if they agree,” said Mbalula. 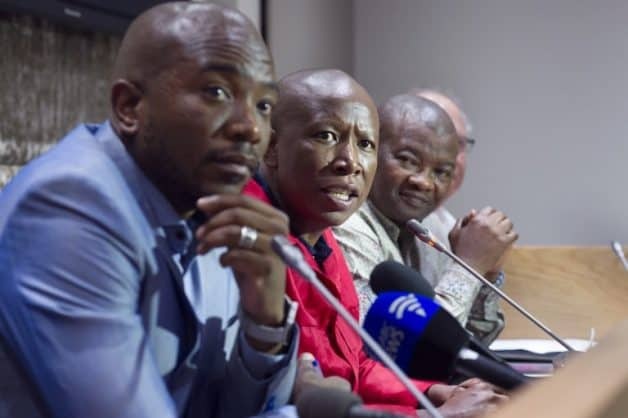 Meanwhile, it was reported in a separate Mail & Guardian article that Mmusi Maimane has requested an urgent meeting with EFF leadership next week. “The DA-led coalition stands firmly against the corrupt [way the] ANC are playing politics, trying to get their hands on the people’s money through the back door,” Malatsi said. Beleaguered Tshwane mayor Solly Msimanga himself appears to believe that smoothing things over with the EFF is possible. “We are going to try and reach out to the EFF. We need to work with the EFF. It would be delusional for us to think we can do this without the EFF,” he said on Thursday. “We may not be in a solid and formal partnership with them but they are voting with us on a number of issues, we’ve been able to pass budgets because of them, they’ve brought a number of issues to our attention that we are implementing,” he continued. This seems at odds with what appears to be a refusal from the EFF’s side to continue the informal alliance that led to the DA taking over from the ANC in places such as Tshwane, Johannesburg and Nelson Mandela Bay. The party has already helped oust the DA’s mayor and speaker in Nelson Mandela Bay, replacing them with a UDM and ANC member respectively. They also made clear their intention of getting rid of Msimanga too, only failing to do so as their motion of no confidence was dismissed on technical grounds, prompting them to walk out of the meeting, and because a similar ANC motion was withdrawn. The ANC claim to have withdrawn the motion because of unhappiness with Tshwane speaker Katlego Mathebe’s decisions at the meeting, although it may have more to do with the fact that, with the EFF absent, the motion would not have succeeded. However, while Mbalula has expressed interest in a coalition with the EFF, Julius Malema has said that he isn’t interested in a “formal” partnership but may agree to vote with them as they have done with the DA before. “We will vote for them if we want to vote for them. We don’t want to have some form of arrangement or some formal relationship. We are fine,” said the leader of the red berets. “We are an independent organisation that takes independent decisions. We are not bound by anything. We will not surrender that freedom,” he continued.